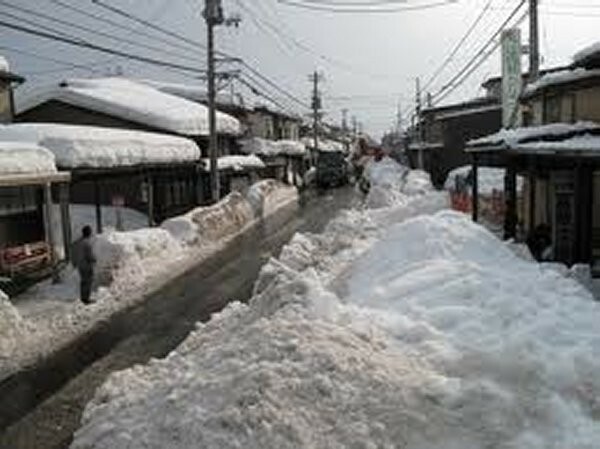 The first picture tells you a scene of “Simultaneous Removing Snow” at Takada Ward in Joetsu City. You can see “Covered Alleys” on both sidewalks. Actually, there once were lots of “Covered Alleys” in this area, the center of Arai when Yoshy was a child, around half century ago. Probably, Yoshy believes the front part of A’s house is the last “Covered Alley” not so much in Arai Ward as in Myoko City. 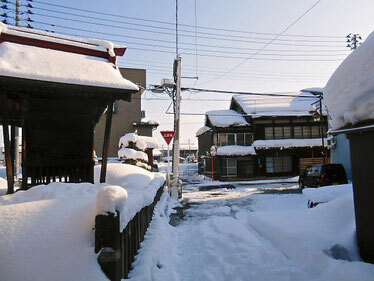 The left building on this picture is “Enmei-Jizoson, Life-Prolonging Jizo Shrine”, which located to the west. Walking up toward the north of this side, you’ll reach Shihoya Bookstore, LL Shihoya Arai School soon. There were many stores on both sides. I wonder how it was before my birth. “Covered Alley” was one of wisdoms of the snow region. This means “the ancient landscape for walking”. I’m sure flurry words must have been full in here, don’t you think? We had more warmth in spite of inconvenience those days, which might depend upon Yoshy’s age, mightn’t it?